Are you new to G.I. Joe collecting and becoming confused by certain terms being tossed around in the community? Look below for some relief. This refers to the smaller feet of the early Joe figures. They were quite plain and simple. Later feet had more detail in the toes and even toenails. Some very early figures had brass covered rivets. Hands which have fatter fingers, crude detail and possibly some plastic flash on the fingers. The very first of these were made of cloth and not plastic as in later releases. VERY RARE! The very first of these were made of cloth and not plastic as in later releases. Extremely hard to find. VERY RARE! The very first of these were made of cloth and not plastic as in later releases. RARE! These were the narrow boxes which were used for vintage figures consisting of a basic bottom portion and a top which fit over it (like a coffin). The top cover had the artwork for the product. These are samples of a finished or near finished product (e.g., an action figure). Early version of the .45 pistol with a finer grip. This has a higher demand. These are the Soldiers of the World figures (Japanese Imperial Soldier, British Commando, German Stormtrooper, Australian Jungle Fighter, French Resistance Fighter, Russian Infantryman). These have a different European face (the Japanese had an asian face) with no scar. This refers to the G.I. Joes with Life-Like hair. Also known as flocked hair. Some of these were painted hairs that had flocked hair applied. Yellow version of the original action pilot flight suit. RARE! A first issue piece also known as yellow lifevest vs. orange. Items made like vintage Joe items by different manufacturers. Lower quality. Introduced in 1974. Flexible hands which gripped items easier. Over years of use, these hands discolored and deteriorated. Reintroduced in 2002 with the new Danger of the Depths figure. These are early figures with extra paint detail under the eyes and thick painted eyebrows. Also known as eyeliner faces or Trademark Joes. These are the first issue G.I. Joes 1964-1969. Like it says, the hair was painted (red, brown, black, or blonde). The early series of figures had flesh painted rivets (holding the figure together). This was discontinued during the Adventure Team era. This refers to a Joe whose head has shrunk over the years. A bump appears at the top of the head caused by the inside pin that attaches the head to the figure. 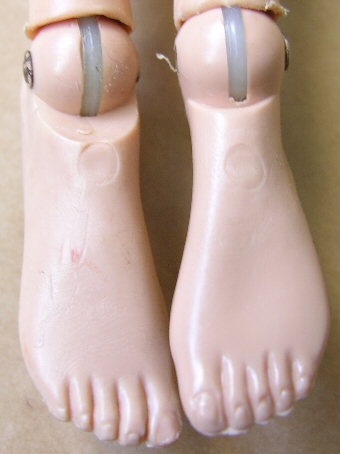 The very first figures came with boots made of rubber and had great detail. They came in both black and brown. Many times today, the rubber has hardened. The bottoms will say HASBRO and have a registered trademark symbol. RARE! This refers to the Super Articulated Joes that premiered late in 2001. These figures had a design similar to the Dragon figure and were much more poseable than previous GI Joes. The actual Hasbro designation for these figures were “Super-Poseable”. These early figures have holes bored through the shoulders. Later figures will have the slot without the round bore. RARE! Soldiers of the World – An action figure made by Formative International. Hasbro designation of figures appearing late in 2001 using a much more poseable body design. Collectors refered to these as SA or Super Articulated GI Joes. Super Vintage. The GI Joe Collector’s Club combined the super poseable (super articulated) modern figure with a re-tooled neck post and a vintage head (both classic painted hair and adventure team life-like hair). Vendor Supplied Product. These are the first factory samples for review. They are used to check the tooling and clothing fit. The coloring is not usually the same as the finished product. These are RARE. This is a large relatively flat box with a cellophane window in the front. Uniforms or accessories are sewn onto a card and inserted into the box. What Year was My G.I. Joe Made? If you have a G.I. Joe and want to know when it was produced, look below. The copyright information is located on the torso of vintage and reproduction (Timeless Collection, Masterpiece Edition) Joes and the lower back of Hall of Fame & Classic Collection Joes. The copyright on more recent Joes is on the buttocks. The copyright may be the same even though the head sculpt and hand design has changed (e.g., WWII head, gung-ho grip, etc.). If you find the copyright info of a vintage Joe on his shoulder, hang on to that Joe! You’ve found the holy grail as these were early salesman samples.